Mother's Day is just right around the corner (how is this possible ALREADY???) and this year I vowed to actually make my Mom's card. Yes, I usually just swing by Target and pick up a card. BUT not this time. 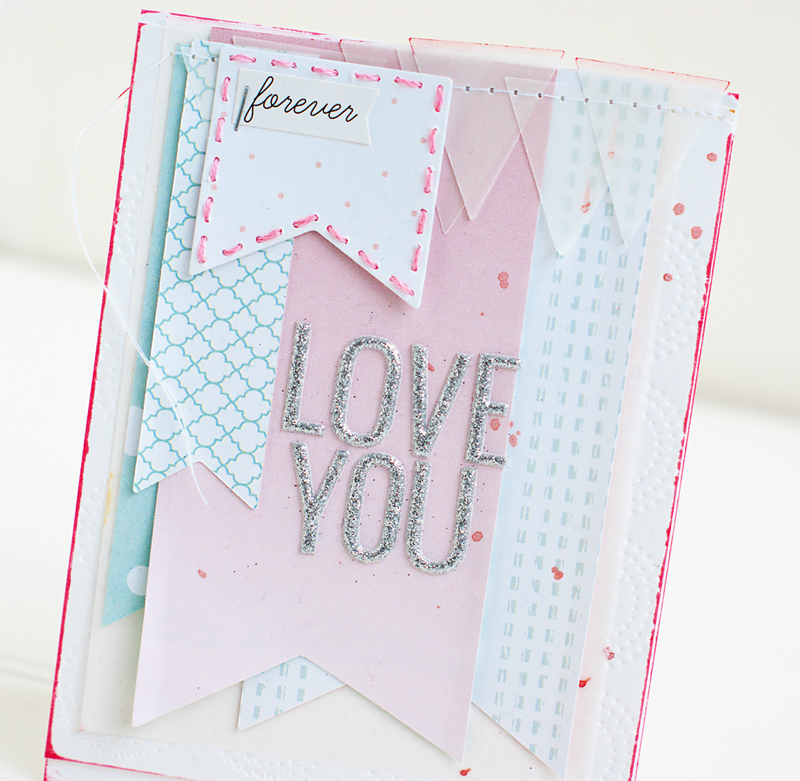 I was super-inspired by Maggie Holmes' cards in the Studio Calico Gallery lately. She's been using a lot of layers and banners and they are just so fantastic. ...a couple of Lifestyle Crafts flag dies...I thought these would make perfect little banners...a Lifestyle Crafts embossing folder (Dainty),and some embroidery floss and a paper piercer. 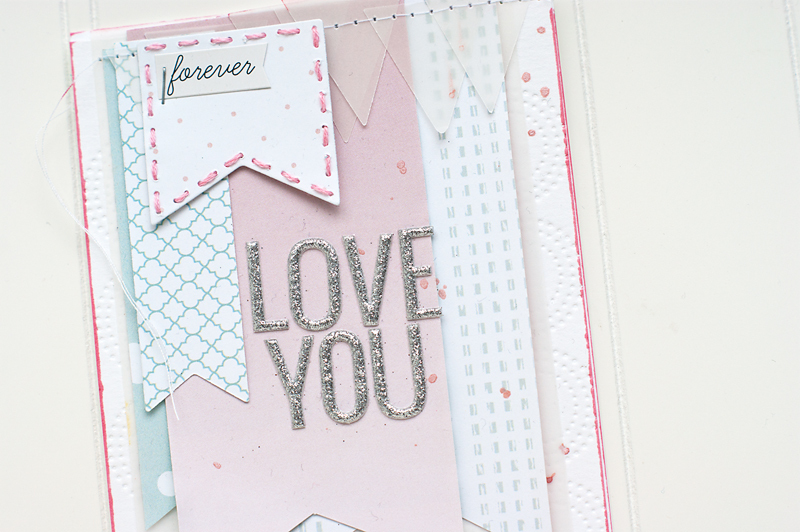 I also grabbed a few pieces of the new Glitz Design Carpe Diem paper to use for my layers. I started by using my Evolution and Genius Platform to cut the flag dies. The little holes you see in the die above are to stick a little pin or stylus through to help you remove your cut paper from your die...but I thought it would be fun to use them as a stitching guide. Soooo, after the banner was cut, I left the paper in the die and used my paper piercer and mat to make the holes that I would use to complete my stitching. See the little embroidered flag up there??? So cute, right? Love it. Then I used the other flag die to cut the little lattice-pattern piece you see above. 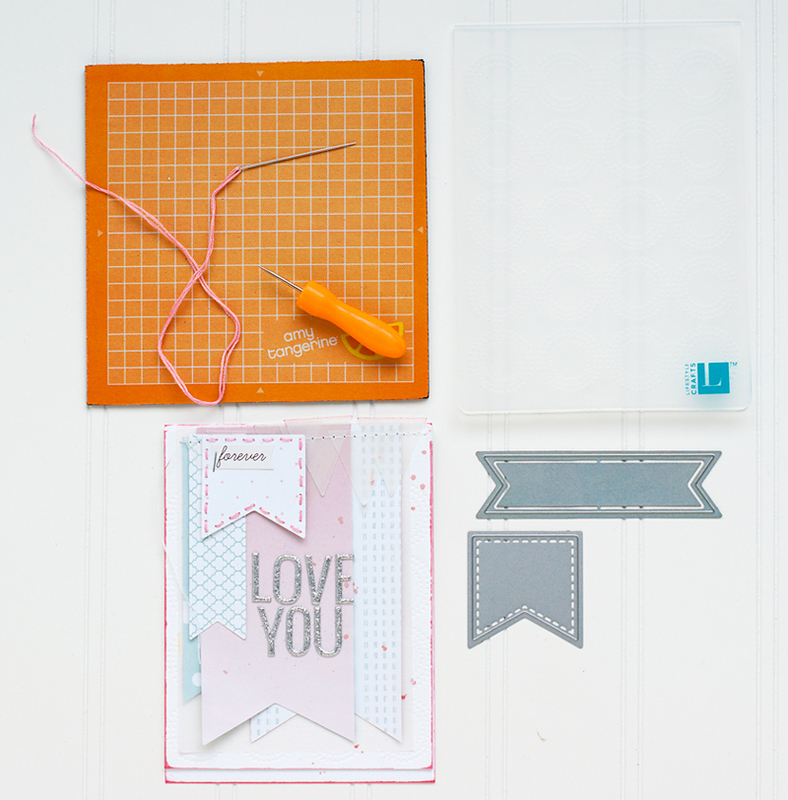 I love using the dies...they make such a sharp, perfect cut. A few more pieces of the gorgeous Carpe Diem paper fussy cut into banners and I've got almost all my layers ready to assemble. Next I grabbed a piece of Lifestyle Crafts No. 10 letterpress paper to use for my card base. The No. 10 paper is 4x9.3" and folded in half it's the perfet size. It's also super-thick and soft and is just beautiful and classy-feeling. After I had my base I took one more piece of No. 10 and cut it just shorter than half. I ran this piece through my Evolution with an embossing folder (Dainty)...and out it came with those fantastic circles of dots you can see just poking out under some of my paper layers. Almost done gathering my layers! I've been adding vellum to almost all of my projects lately. I had a small piece and some little punched banners leftover from a layout I had been working on, so I grabbed those for my card, too. Now here was the fun part. I started with my embossed paper...on top of that I added my vellum. Then came my various banners...I added a small amount of adhesive to the backs of each banner as I was layering them and then I ran the top edges through my sewing machine...randomly adding little vellum punches along the top as I sewed. Next came my stitched flag...I added that right to the top of the rest of the layers. Then I took the whole stack and adhered that to my card base. To finish things off, I added a line of pink stamp ink around the edges of my base (not sure I like this, but meh...it'll do) stapled the little "favorite" sticker (also from the Carpe Diem collection) to my stitched flag, and adhered "LOVE YOU" to the front of my card using a beautiful silver glitter alpha (from Pink Paislee). ooops! Forgot! 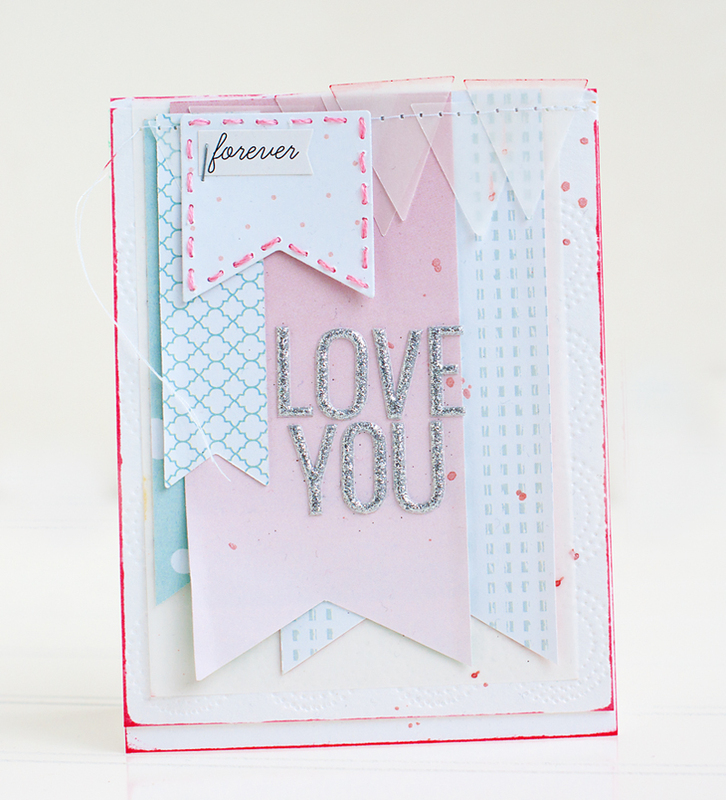 Just one more thing...I add a few drops of pink mist to the top of the card...just for some extra ooomph. And that's it! 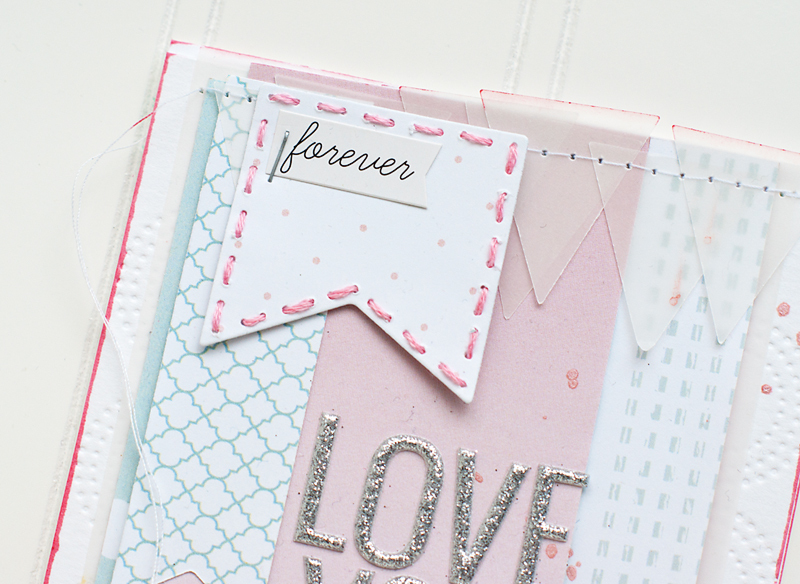 I love the look of the little embroidered banner...and I want to check all my other dies to see if they have those holes around the edges...so fun! Like some of the products you've seen? Don't forget you can get 20% off any item you purchase from We R Memory Keepers using the promo code: MIDWESTERN ...so awesome! Love this card! 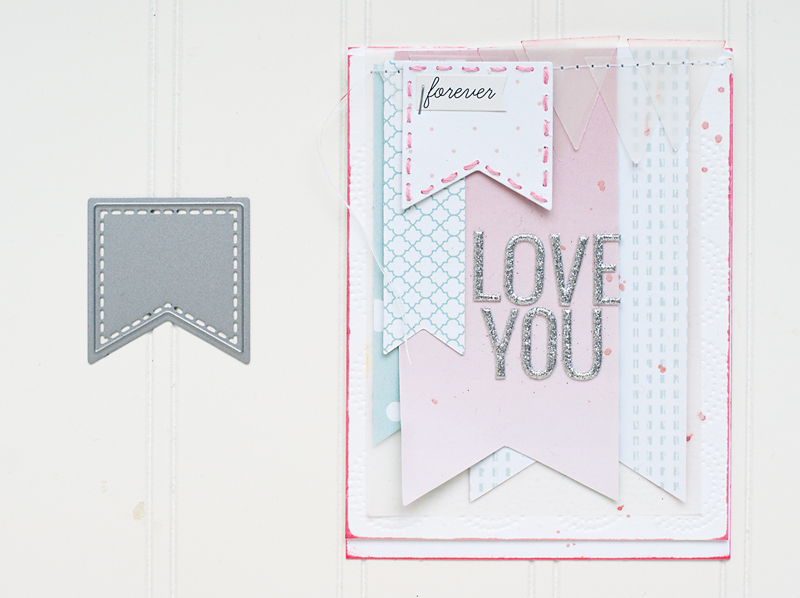 If you didn't add the ink to edges, it would be super-pastel-y. lol I think it adds the perfect little oomph! Happy day!